The new Mustad Luggage range has been designed specifially for the saltwater angler. Incorporating the new Zip-Less design across the entire range means you will never again have to worry about saltwater corrosion. The shoulder staps on the Mustad Rucksack feature the new quiver grip technology helping to keep your holdall in place when walking. This feature-packed product will ensure you make the most out of your sea fishing experience. Rod holdall/ quiver grip technology. Highly visible rain cover stored in base. Looking to buy some Rucksacks / Carryalls as part of a fishing gift? If you would like some advice on purchasing Rucksacks / Carryalls, simply contact our expert fishing team, giving us either an email or phone number on which to contact you and we'll get back to you right away with the best advice and prices. 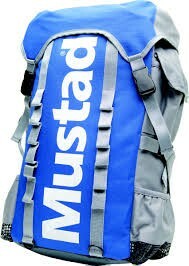 FREE Delivery on all Mustad Rucksacks / Carryalls over £100!! !